Gringo Records - SOUVARIS - "A Hat"
"A Hat" is the second album by Souvaris via Gringo Records - the result of over three years of writing and mastering, "A Hat" is a progression from their previous album, "I Felt Nothing At All" (2005) developing a new sound and a new approach which has been described as an amalgamation of the krautrock motorik of Neu! and Can, with the grooves of Tortoise and Battle, and the odd Yo La Tengo or Bedhead- esque pop hook. Adding wandering chords and ambient washes to their now tight grooves, intricate rhythms and playful melodies, the band - Aaron Doyle, Dan Layton, John Simson, David Stockwell and Ian Whitehead - have played countless shows over the six years they've been together, with luminaries such as Explosions in the Sky, The Shipping News, Matt Elliot and Fly Pan Am. 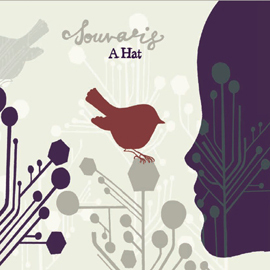 Live, Souvaris deliver a show that is as entertaining as it is subtle, direct as it is layered. 2000 CDs in digipack sleeves.